I returned to Tanzania for a second short trip a few in November 2011, mainly to look for Ader’s Duiker on Zanzibar and to spend a little time with Charles Foley in Arusha . 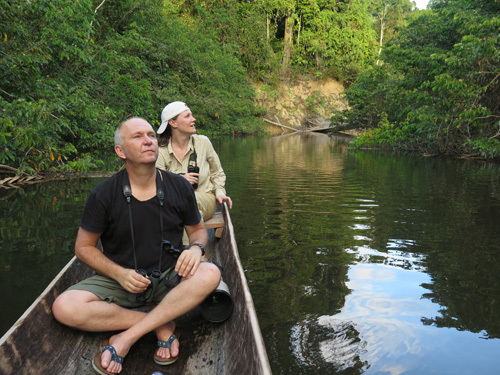 Charles and I had been corresponding for several years (indeed it was his report that inspired me to look for Ader’s Duiker). Charles is also the author of the indispensable Field Guide to the Larger Mammals of Tanzania (2014). If you want to see an Ader’s Duiker then you should start by contacting Charles Foley who can arrange a visit. 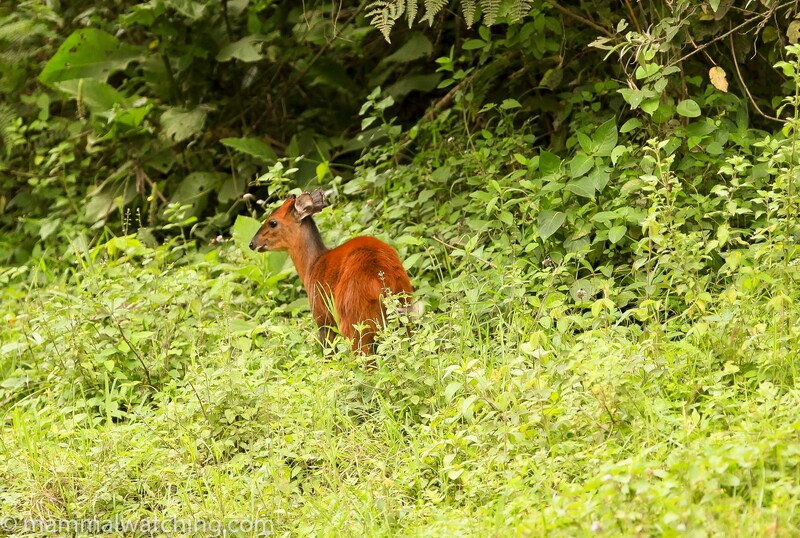 The Duiker are in a forest near Mtende village in the south of the island. I arrived at the Karamba resort – an hour from the airport – and 20 minutes from Mtende at 22.30. I hadn’t eaten since breakfast so should have thought to let them know I needed some dinner. The kitchen was shut so I made do with couple of bananas and some chocolate biscuits. The best times to look for the Duikers are early in the morning and late in the evening (its perhaps not suprising that Phil Telfer struck out – see his 2010 report on the main Tanzania page – as he didn’t start looking until 8.30am). I left the hotel at 5.15 am and by 5.45 I was walking into the forest along with a couple of villagers. It is a thorny bit of scrub on coral and impossible to move quietly. Duiker signs were plentiful. The guide’s technique was to find find a good spot and sit quietly. At 6am we were at the first site, and at 6.20 we heard a Duiker. We must have startled it because it took off with an alarm call and, though I didn’t see it, I think the other two had a clear line of sight. Undaunted we moved to a second spot and sat down at around 7am. Twenty minutes later we heard a Duiker approaching and I got a decent look for about 30 seconds at this rare antelope. There appears to be a healthy population of animals here so let’s hope the village keep protecting them – and if they can attract a few more tourists like me they will be more inclined to. Photography is all but impossible in the forest and if I went back I wouldn’t lug my camera around. Trying to see one while walking around is also I suspect impossible: they are immensely wary (though I suppose at night it might work). In any case the guide’s technique of sitting and waiting seems to work well. 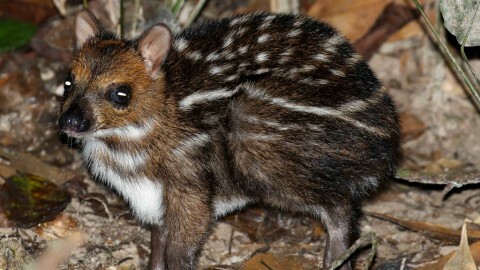 After we saw the Duiker we visited another patch of forest and they quickly showed me a fabulous Zanj Elephant Shrew. We also saw Zanzibar Red Colobus in the forest, and heard Red-bellied Coast Squirrel (I think, though it could have been a Zanj Sun Squirrel) and Blue (Sykes’s) Monkeys. 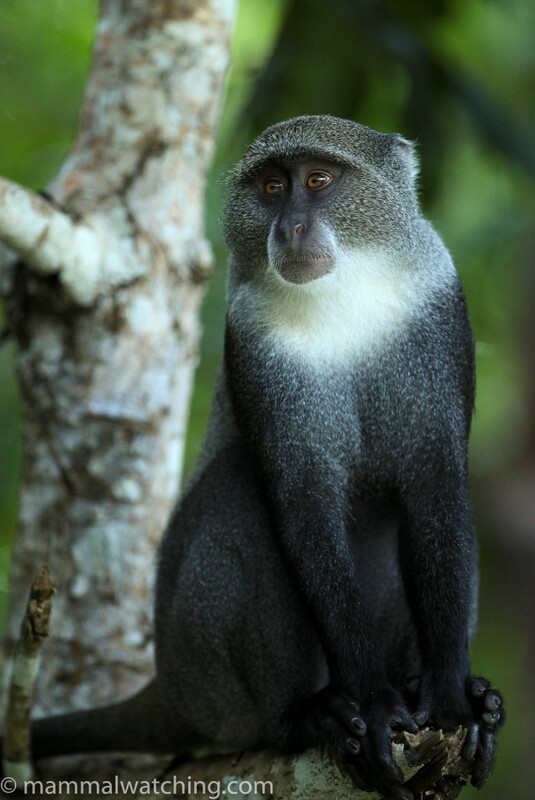 There are several other species on Zanzibar I wanted to see and Jozani Forest – about 30 minutes from my hotel and 30 minutes from the airport – probably offers the best chance of seeing them. 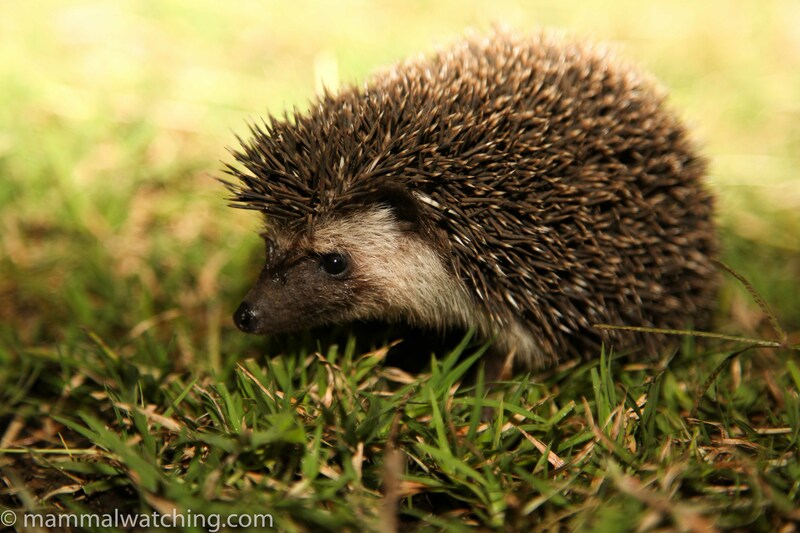 The reserve shuts at 5pm but Charles’s contact on the island – Said – arranged permission for me to visit after dark. Phil Telfer recommended a guide called Bakari and I met him at 4pm at the forest HQ. 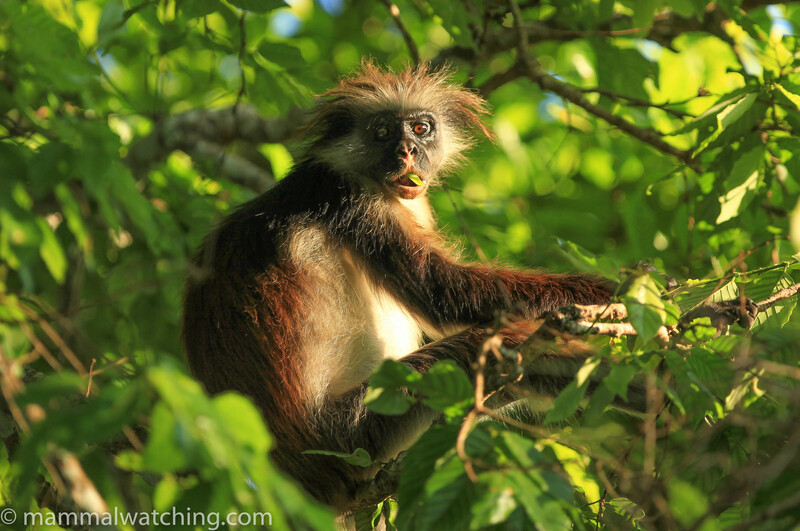 Jozani’s main claim to fame is its Zanzibar Red Colobus Monkeys. These are easy to see – particularly in the patch of bush on the other side of the main road. 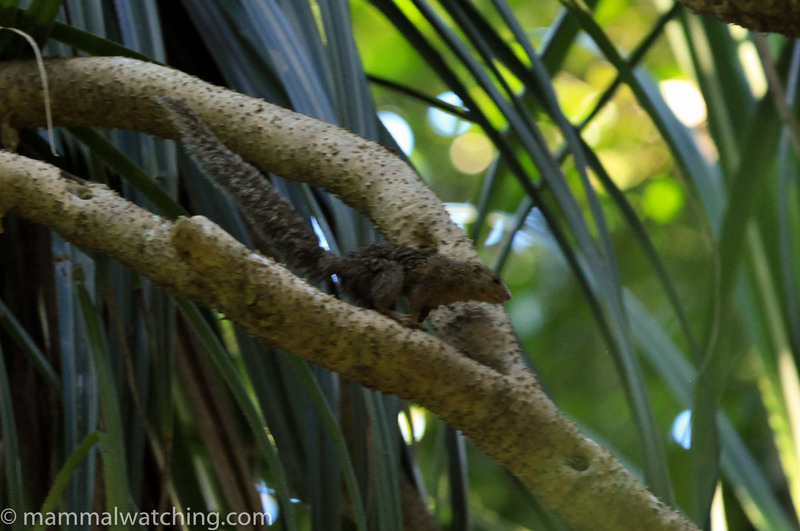 There appear to be just 2 species of squirrels in the reserve (and on Zanzibar). My first target was a Zanj Sun Squirrel – the harder of the two squirrels to see – but Bakari heard one calling in the forest after 20 minutes and we got a decent look (it doesn’t look a great deal like the illustration in Jonathan Kingdom’s field guide). There were plenty of Blue (Sykes’s) Monkeys in the forest too. 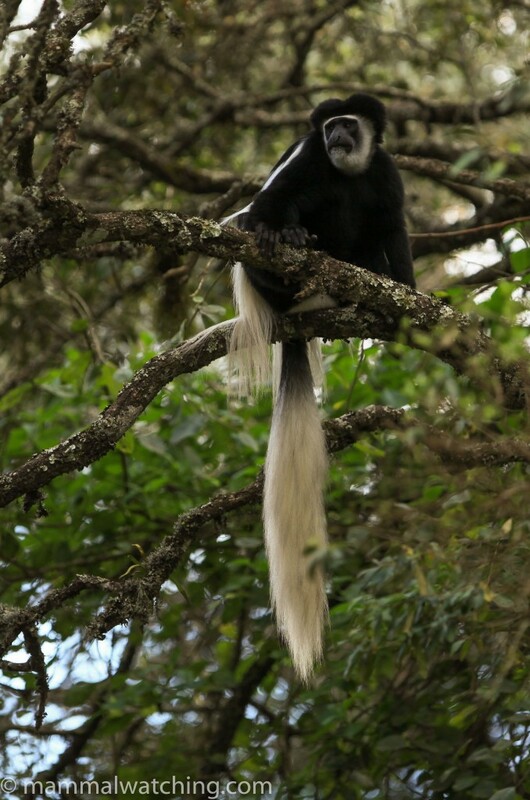 We then crossed the highway to the farmland on the other side and saw a couple of Red-bellied Coast Squirrels as well as the Red Colobus and Blue (Sykes’s) Monkeys. 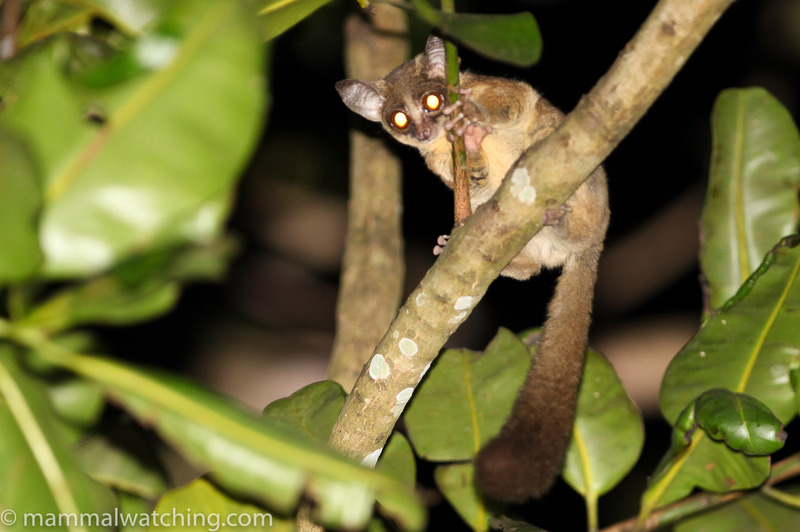 On the entrance road to the forest at dusk we saw several of the little Zanzibar Bushbabies – my second target species. Small-eared Galagos are quite common too and we heard them calling but didn’t try to see one. My other targets for the night were Bushy-tailed Mongoose, Eastern Tree Hyrax and Servaline Genet. The former, in particular, is quite common on the island and Charles advised that the rubbish dump next to the forest HQ is a good stake out. Phil Telfer saw one near here. We didn’t, although we did startle something in the rubbish dump that may well have been one. Nor did we hear any Hyraxes calling, while Genets are quite an uncommon sighting. All we saw in the forest was a Blue Duiker and we heard what Bakari thought was a Four-toed Elephant Shrew. Bakari didn’t seem to want to stay at Jozani past 8pm so he gave me a ride on his Vespa to his village a few kms away and we looked around there for half an hour. Bushy-tailed Mongoose are around there too, though seen less often than they were a few years ago when the forest around the village hadn’t been chopped down. I spotted a Gambian Pouched Rat feeding on fallen mangoes, and we got eyeshine of what may have been a Small-eared Galago though it was very close to the ground. I got back to the hotel at 9.30 looking forward to some of the tapas on their mouthwatering menu to find the kitchen had shut at 9pm, not 10pm as I was told (twice) it would close. Dammit. If you stay at the Karamba then be very clear about when you will eat! 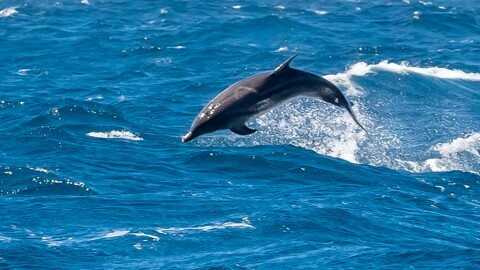 The ocean off of the coast here is well known for its dolphins. Like Phil I took a trip the next morning to snorkel with a pod. The visibility was a wonderful – 40 metres or so – and when we eventually found the animals I got great views. Both Humpbacked and Indo-Pacific Bottlenose Dolphins are in the bay and both are quite common. We only saw the Bottlenosed and this is the species which that you swim with (the Humpbacks are relatively shy). Charles Foley has been working for 20 years in Tanzania on Elephants and for the Wildlife Conservation Society. He’s a fellow mammal nut and probably holds the record for the most species of mammals seen in 24 hours (see the report of his world record which he is contemplating trying to beat). We’d been corresponding for several years so of course I wanted to take the opportunity to meet him and look for a few things together. Charles and Lara were generous enough to invite me to stay at their home in Arusha for a night, after which Charles and I planned to head off to a game farm on the slopes of Kilimanjaro which appears to be one of the very few places in the world where there is a chance to see an Abbot’s Duiker. 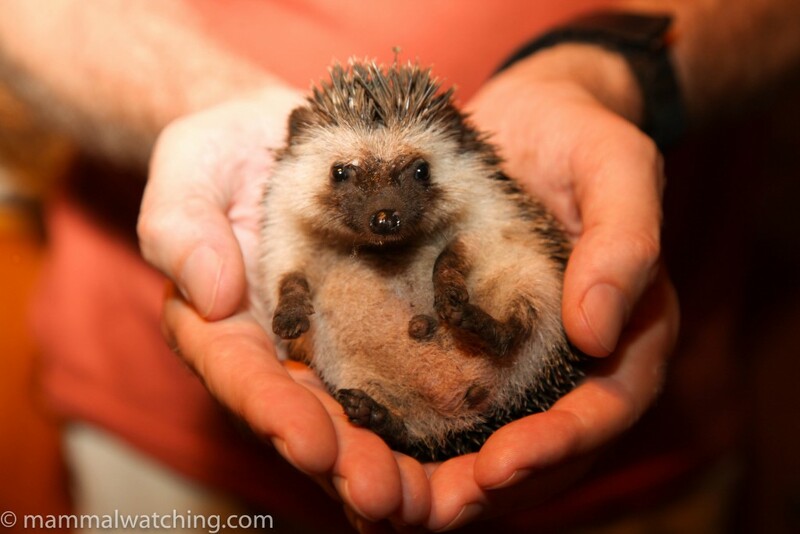 My flight was late but I still arrived in time for the staff in the house to find me a great little Four-toed Hedgehog (my first) which are usually knocking around the garden. In the morning I saw one of the resident Ochre Bush Squirrels. 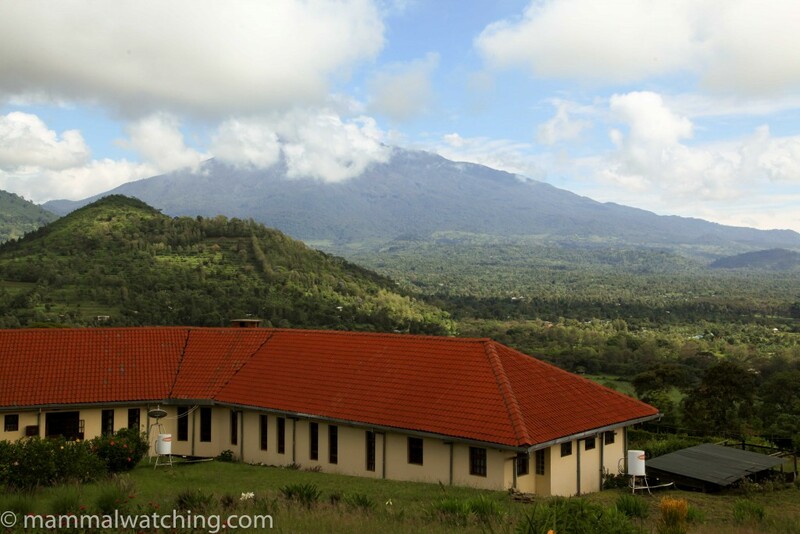 Charles, his colleague John, and I were going to spend two nights at the Simba Farm on Kilimanjaro and we travelled out there via Arusha National Park on Mount Meru. We only saw the Arusha Park for a couple of hours but it was well worth the detour – very scenic, with some lovely primary forest and good mammals. We saw Olive Baboons, Buffalo, Zebra, Bushbuck, Warthog, Giraffe, Blue Monkey, Guerza Colobus, Suni, Harvey’s Duiker and Bush Duiker (the old growth forest patches are especially good places to look for both Suni and Harvey’s Duiker). Charles recommended we stay at Simba Farm on Kilimanjaro. He had several reasons. First, the farm is a friendly place to stay with comfortable rooms and excellent food and it is cheap – much cheaper than similar accommodation within a national park. Second, we could do as we wanted on the farm and, in particular, spend hours spotlighting at night (something prohibited within a national park). And third, there are uber-rare Abbot’s Duikers living in the forest that borders the farm, and they are seen at the edge of the fields from time to time. 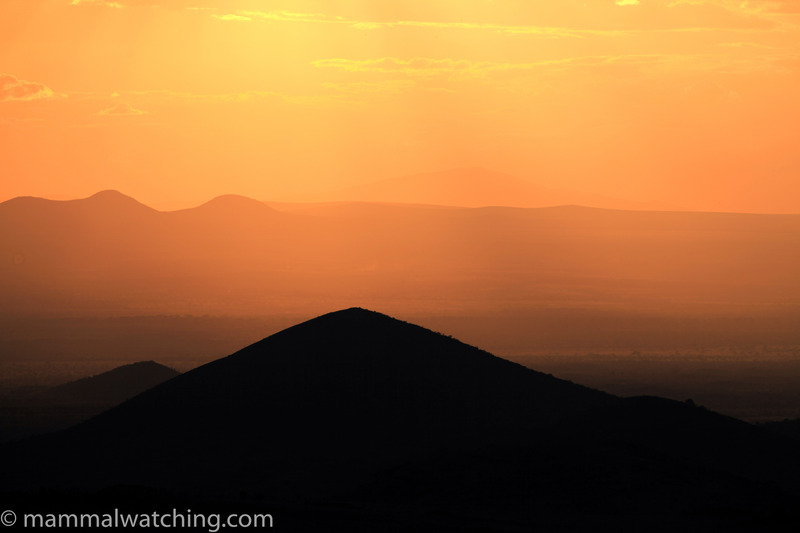 The farm’s view – out over Mt Meru and the Serengetti – is as good as it gets. I don’t think I have ever seen such a beautiful sunset. Charles has never seen an Abbot’s Duiker. Given that he has lived in the area for 20 years, and had visited the farm several times, I didn’t hold out too much hope but after talking to several people I was more optimistic. The animals are seen – not infrequently – at dusk and they are seen by people not looking specifically for them. So it was certainly worth making an effort to try to see one, in particular by scanning the forest edges with a scope at dusk and spotlighting in the area. We didn’t see an Abbot’s Duiker but we did collect a range of interesting species during two long spotlighting sessions. African Wild Cats are common, as are Bush Duikers and Steenboks. 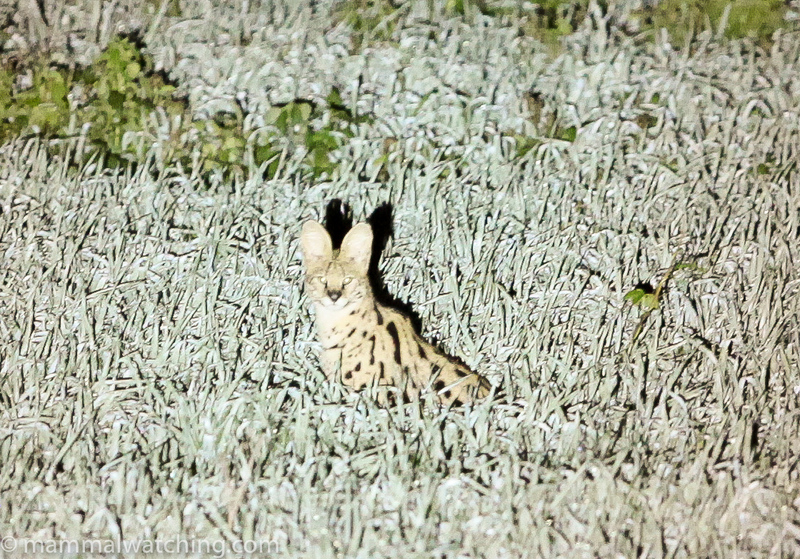 We also saw a Serval both nights, a Blotched Genet, a White-tailed Mongoose, an African Civet and a Spotted Hyena. Two of the more unusual species we saw were a Zorilla and a pair of Side-striped Jackals. We tried hard to find Crested Porcupines and Senegal Galagos (both of which are on the farm) but couldn’t see any. We saw a Natal Multimammate Mouse (Mastomys natalensis) while Mesic Four-striped Grass Mice (Rhabdomys dilectus) were quite common too (though the IUCN treat R.dilectus as synonymous with R. pumilio from further south it seems they are set to be a separate species). 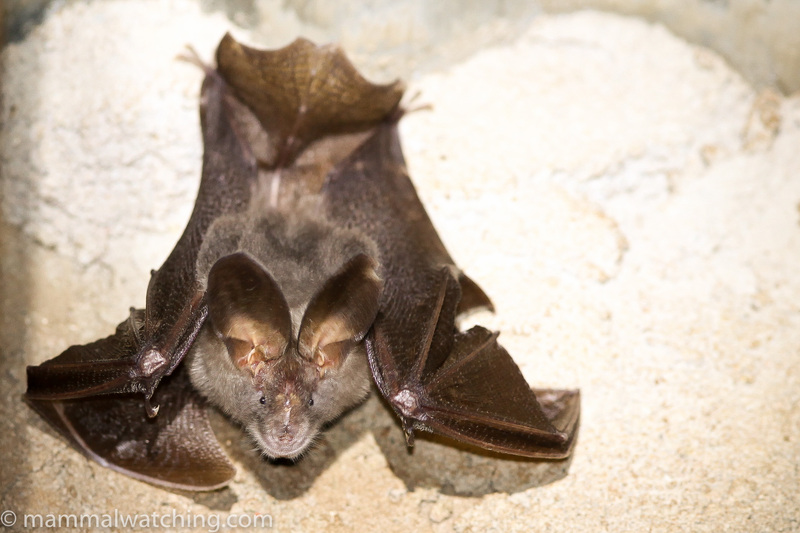 A small colony of bats in the store room turned out to be my first Large-eared Slit-faced Bats (Nycteris macrotis). I’d like to get back to Tanzania to spend more time with Charles, visit again the Simba Farm and maybe see an Abbott’s Duiker. A big thank you to Charles and Lara for their hospitality and enthusiasm, and for their help with Zanzibar too.